In a time of loss, the church is a natural place to turn for help, and Pastors Bryn Smallwood-Garcia and Jennifer Whipple are available to offer comfort and guidance for those who grieve. To talk about scheduling or planning a funeral or memorial service, please call the church office (203-775-1259), and a secretary will connect you with a pastor to help you. Our church facilities are heavily used, so we ask that you refrain from announcing the date or time of a service until meetinghouse availability has been confirmed with a pastor and the church secretary. The stone wall in the Memorial Garden of the Congregational Church of Brookfield is built into the wooded and natural area to the west of the Church building. Placed at the entrance of the planned Outdoor Chapel, the wall defines an area whose natural surroundings invite the visitor to contemplate life with thanksgiving and point to the hand of the Eternal in the world around us. The stone wall in the Memorial Garden is constructed to contain columnar niches for permanent placement of cremated remains. The wall is built of natural stone and topped with stone slabs. A uniform bronze marker gives the name and dates of birth and death of the person being remembered. The Memorial Garden wall is a fitting resting place for the earthly remains of loved ones. 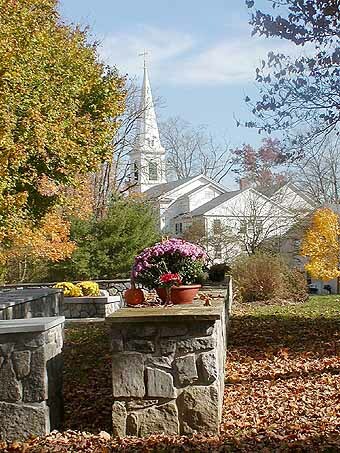 The Memorial Garden is on the grounds of The Congregational Church of Brookfield and is managed by the Memorial Garden Committee of the church. To reserve a place or places in the Memorial Garden wall you may call the church secretary for an application (203-775-1259). For additional information, ask for a member of the Memorial Garden Committee to contact you. An increasing number of people prefer cremation and are asking that their remains be cared for in this way. It is seen as a convenient process by which expense may be minimized and land space preserved for other uses. Cremated remains (ashes) may be interred (earth burial), or may be given to one's heirs for placement in a memorial niche or scattered, where legal. The ashes are delivered to the family in a container (box or urn) and may be stored indefinitely or hand carried or mailed for distant disposition. 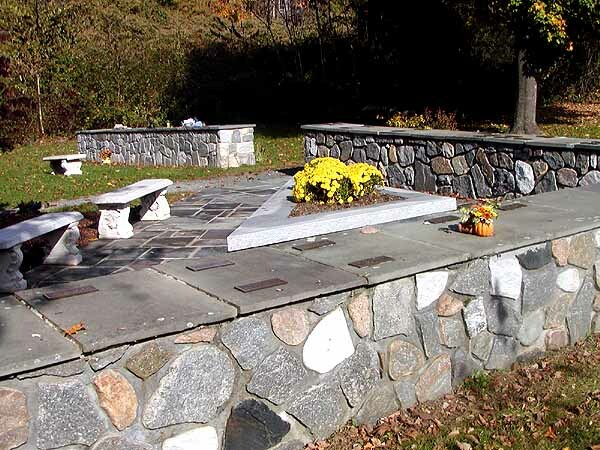 The CCB Memorial Garden provides an appropriate alternative for the disposition of cremated remains. A uniform cast bronze marker, placed on the top surface of the flat stone slab to mark each niche containing cremated remains, is provided. Contact the church office by phone at 203-775-1259, or by email here. To purchase a wall niche, please call the church office at 203-775-1259, or ask to have a member of the Memorial Garden Committee call you to make the necessary arrangements. Many of us have at some time, desired to memorialize a loved one. Moreover, most of us would like to strengthen our church, add to and improve its facilities, thereby prolonging within it the influences that have been released by devoted Christians of other days. Our church has a very appropriate plan by which an interested person can do both of these things. The cherished memory of a loved one can be honored and the present and future good of the church can be enhanced through The Book of Remembrance. The Book of Remembrance is a memorial book displayed in the Meetinghouse, recording the names of those in whose memory gifts are made to the church together with the names of those making the gifts. (The amount does not appear). This book provides a fitting method and place in which a gift, of any amount, is lovingly offered, gratefully received and used for the continuing good of the church. The gifts are acknowledged to both the donor and the family of the person remembered. All purchases which the church makes with these funds will be in loving remembrance of all persons whose names are inscribed in the Book of Remembrance. No monies are expended in memory of a particular individual or group of persons. Twice a year a memorial service is held during the Sunday morning worship at which time these gifts are recognized and dedicated, and persons memorialized are remembered in prayer. The Book of Remembrance appeals to a great many people as a most beautiful and appropriate way to pay tribute to those whom we have loved. This page was last updated on 05/26/2017 03:15 PM.